In this 3-person group project, the goal was to explore a specific community and their relationship to a specific social theme and to communicate findings in a way meant to evoke understanding and empathy. The group was supposed to choose one population and one theme to focus on, using this to develop a research objective and research plan. I was assigned to the group with Tiffany Wang and John Sun. We brainstormed and decided together that we wanted to choose the topic we would like to learn more about. I introduced Education in Prison. This is something we know little about and has huge research potential. After starting, we quickly found that Education in Prison is interesting and the reality is different from preconceived notions, but it also makes the recruiting process very hard. The advisor for this project was Amy Bickerton, User Experience Designer and Researcher. We brainstormed together different ideas of the questions we wanted to answer. We decided to examine the preconceived notions of the public. My idea was to focus on the quality of education in US prisons today. We brainstormed what we needed to do in order to learn about Education in Prison. I decided to do surveys, write interview questions, and synthesize gathered information. 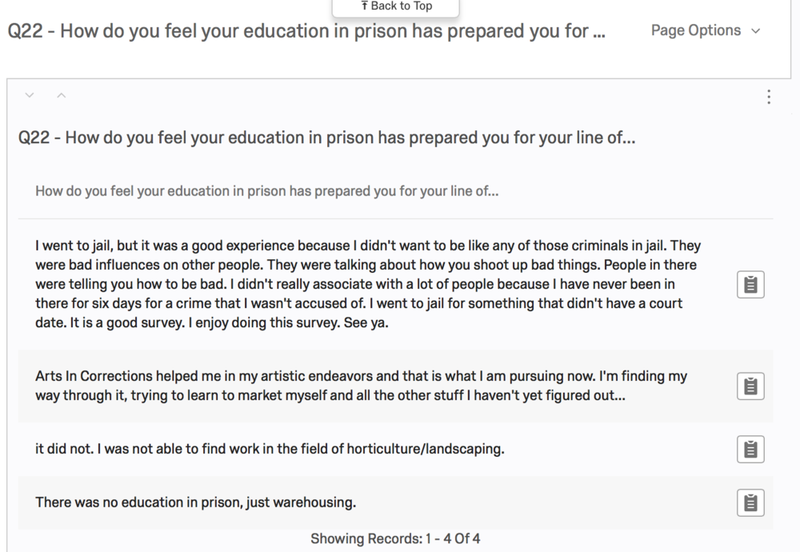 After John conducted a secondary research, I made a survey for Ex-Convicts, Prison Educators, and Prison Researchers to get qualitative data. I quickly learned that the hardest part was recruiting people. I reached through many channels: prison online forums, The Crossroads Cafe in SF where ex-convicts work, and the Prisoner’s Research Program in Berkeley. Eventually only 4 people responded, but their responses gave us the idea of what kind of questions we would like to ask the interviewees. I made an interview guide as an online document and asked my teammates to modify it. We ended up with a good amount of quality questions. The recruiting process took a lot of time. We had to explore our networks and be creative. We found six people who were either ex-convicts, prison educators, or had significant experience with the topic. Our first interviewee was Adam from Delancey Street Foundation. I was responsible for recording and taking notes. The research process contains a huge amount of information. For each interview I made a one-sheeter to have easy access to the most important and insightful information. Out of the information we collected we created a Mental Model. I divided the model into two main parts: in prison and post prison. After that, I added two more categories: education and employment. We rearranged the sticky notes to create a timeline of the insights. This helped us understand the topic better and identify pain points. Based on our research we made a stakeholder map. I labeled 3 types of stakeholders: directly affected, indirectly affected, and internal. After the project ended, I wanted to understand the education experience of teachers. I wanted to find out what can help them in communication with their students and make the education experience better for both student and teacher. As a warm-up I proposed choosing cartoon character they identify with. I prepared stimulus sets with pictures on various topics and gave them to my interviewees with pieces of paper, glue and markers. I asked them to choose the photos that they can identify with their teaching experience, and make a collage out of it. The second task was: "Imagine that you can create an ideal classroom and device for teachers. You can use magic. Please draw it." From the generative research I learned that involving experts in the design process leads to quality ideas.